We only have two days left before submissions close on the draft law to secure a ban on new offshore oil and gas. If you haven’t already, can you make a submission today? Big oil is lobbying hard to water down the draft law so they can continue their destructive industry. Our climate and oceans simply won’t cope if they win. We need to show strong support for the draft law and strengthen it even further. What do you mean when you say “our climate and oceans simply won’t cope if they win”? What do you mean by “we need to … strengthen [the draft law] even further”? But those big businesses ARE the oil and gas lobby! Who else are you talking about? I recall that New Zealand law is strong on avoiding pollution of all kinds. What pollution are the oil and gas companies engaging in that they wish to continue, what are they destroying and why is the law not already mobilised to stop them? It starts to look as though you’re exaggerating the situation in order to alarm more of your constituents into an elevated response. Surely you know that “big oil” doesn’t use the oil they find, extract and process, but you and I do that. So why do you demonise the oil companies, when they’re just doing it for you and me? We’re the ones who want it. What is your party’s strategy in the event you succeed in closing down New Zealand territory to further oil and gas exploration: Where do you propose to obtain our necessary supplies thereafter? Will that improve the condition of the planet (if not, you should have left well alone)? No, I don’t wish to make a submission before you’ve had a chance to answer my questions. Also, I would strongly prefer a local source (fewer delivery miles) for my oil and gas and all the products that come from them. I’m not optimistic of getting a prompt or useful response from him, so if you have heard from the Greens of their strategy on this, or you have anything to add, I’d appreciate your letting me know. A very well-composed question. I look forward to a well-deserved response from Gareth, the spokesman for Watership Downs. Haha! Not a bad analogy, Mike. But nothing so far. 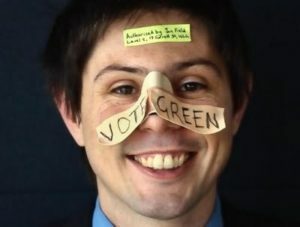 I don’t know why the Greens don’t call themselves the McGillicuddy Serious party, who wanted to take a giant step back.